The Wolfe Pit: Vegetable Beef and Noodle Soup on a Budget! 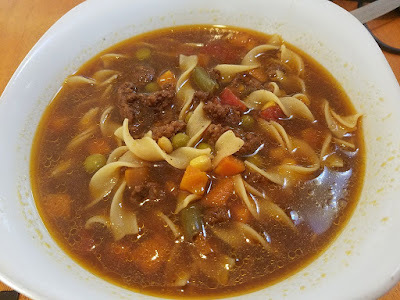 Vegetable Beef and Noodle Soup on a Budget! Add remaining ingredients, mix well and bring to a light boil. Reduce heat to medium low, cover and simmer for 25-30 minutes. Add egg noodles. I only added half the bag, if you want more noodles add more. You may need to add a little extra broth or water as the noodles absorb the liquid. Looking forward to trying this! We love your channel! definitely going to be making this! Really tasty and hearty! Perfect for this poor college student. Thanks Aaron! Glad you enjoyed it! 90/10 will be fine, just leaner with a little less flavor to me. Let me know how you like it James! Thanks James let me know how you like it! im gonna make this today, im gonna add some mushrooms. hopefully it turns out good. Thank you James! Glad you both enjoyed it! Hello my fellow Wolfe! How did you like the soup!?!?! Turkey, chicken or vegetable broth. Tried this today. No modifications apart from adding a can of green lentils. Spot on, filling and hearty and will be making again, perfect after a long day at work! Greetings and thanks from the UK! Will garlic and onion "powder" work, instead of granulated? Yes. Try finding granulate garlic and onion sometime though, it has much more and a better flavor than powder. Hope you enjoy!